Macworld: Multi-Touch Apple Music Device Still to Come? Eleven months before Steve Jobs took the stage, hrmpf.com broke the real story of the iPhone. But could that patent reveal more? Remember patent 0060026536? 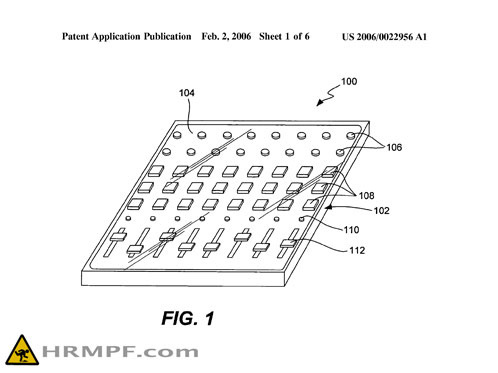 It’s the multi-touch, gestural patent Apple filed that was clearly the precursor of the Apple iPhone. Here’s the curious thing: the iPhone, as demonstrated at the Macworld keynote, isn’t all that focused on multi-touch. With the exception of Apple’s clever zooming gesture, most gestures are single-touch. Most are horizontal and vertical strokes similar to what you can already do on laptop touchpads. A lot of what gets put into patents never shows up in shipping products, but I would be very surprised if Apple’s multi-touch abilities didn’t start to spread to new stuff. Touchscreens and eventually multi-touchscreens are likely to appear on more computers, PC and Mac alike. And other devices have likely lacked touchscreens only because the digitizer hardware — and the processors to deal with tracking multiple touches — hadn’t yet reached the right economy of scale, something that’s likely to happen soon (the iPhone in June being a good indicator). Phones have the advantage of subsidies from the phone carriers — the iPhone would presumably cost hundreds more if it didn’t have Cingular reducing the cost to get you on a 2-year plan. But the touch trend is likely to continue. And that brings us back to the original patent. Could Apple in fact be working on a music mixer or other touch-enabled music interface? Or was this just a demonstration of an idea they had, and not a working product? Time will tell. I’ll repeat my concerns: touch is great in its flexibility, but losing tactile feedback is not — maybe something Apple themselves have discovered. But that’s unlikely to stop manufacturers from integrating touch into products for musicians in the near future, whether it’s Apple or someone else. And it won’t just be the Lemur.